My favourite crochet patterns are the simple ones. Those that don’t involve much counting, or end weaving or increasing or decreasing, or any of those evil shenanigans. I found that the trick to making a simple crochet project into something great is choosing the right stitch and choosing the right colours to go with it. I’m actually getting quite obsessed with colour combos and have even started a Pinterest Board solely for that purpose. 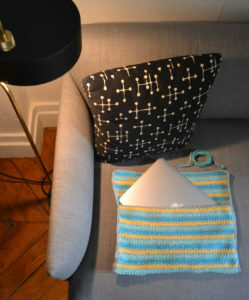 For this laptop bag project, I chose colours that remind me of summer, the beach, and surfing. I don’t surf, but I wish I did. I can also imagine an old VW Bus thrown in there. And ice cream. Nom. In order to make it a bit more exciting than just lines, I chose the Moss Stich, which is totally easy to do, so you can even watch TV while crocheting. I think it turned out great, and it’ll definitely be bringing some sunshine into my next meeting. Yarn: Acrylic DK / Light Worsted, 3 main colours: yellow, light blue, and azure. 1 accent colour: grey. The laptop case you see in the photos is about 39 cm / 15.5 inches wide, so it will easily fit a 15″ laptop. If you’re making one for your own laptop, it’s best to keep it closeby and keep checking how your case fits. To check if you have the right width for your laptop, make sure you check after the first row of moss stitches, not after the chain. The chain will look much too long, but it gets tightened up with the Moss Stitch. I love a good cheat. To avoid weaving in ends, I never cut the grey and just ran it up along the sides and later hid it under the border. I also crocheted over the ends of the colours, so that they would disappear under the next row and I wouldn’t have to weave them in at the end. I’ll illustrate this below. 1 / With your accent colour chain 88 (for 13″ Laptop chain 78), single crochet (sc) in the second chain from the hook. Chain 1, skip one chain link and single crochet into the next chain, so chain 1 skip 1 (ch1sk1) and single crochet (sc). Continue the entire row with chain 1 skip 1, single crochet. End on a single crochet. To change colour I slip stitch the new colour through the accent colour loop I have on the hook after that last single crochet. Then chain 1. Do not cut your accent colour. Turn. 2/ Looking at your previous row, you want to single crochet into the first chain space, then chain 1 skip 1 (the one you’re skipping is the single crochet from the previous row), and single crochet into the next chain space. Continue this until the end of the row, end on single crochet. Chain 1 and Turn. 3/ Repeat 2/ with the same colour, end on a single crochet. Cut your yarn, leaving about 5cm / 2 inches. Now bring up the accent colour yarn that should be waiting for you there and yarn over and chain 1, thereby changing your colour. You should have 2 ends of the previous colour hanging at the side of your work. 4/ Repeat the same stitch for one row with your accent colour. Here is the trick though, you want to take those two loose ends and crochet over them, so that they disappear under the stitches of your new row. 5/ Continue doing 1 row of your accent colour, then 2 rows of a colour, 1 row accent colour, 2 rows colour, etc. always hiding your loose ends under your accent colour. I did a total of 12 sets (1 grey, 2 yellow, 1 grey, 2 light blue, 1 grey, 2 azure). Then I added another row of grey, so I would end on the same colour I started. This adds up to a total of 109 rows. You can make this longer of course if you’d like a longer flap. 6/ Don’t cut the grey. Now you get to put your great work out in front of you and decide where your laptop case will fold. I folded up about 20cm / 8 inches. Make sure that your accent colour rows of the front and the back all line up. Fix your fold together with stitch markers or pins. 7/ Pick the grey back up and start crocheting a border down the side of your work, continuing with chain 1 skip 1, single crochet. Try to space them out as evenly as possible. I did about 2 single crochets for every 3 rows. When you get to the part where you have pinned your work together, simply start inserting your hook first through the front part, then through the back before yarning over, thereby single crocheting both parts together. Fasten off the yarn when you get to the bottom. Reattach it on the other side with a slip stitch and go down the side (don’t forget to magically make your end disappear here too). Fasten off and weave in the ends. 8/ If you would like to add a cord to close the case with like I have done, cut off 150cm / 5 feet of each colour. Find the middle stitch of the flap and bring one end of each colour through the stitch. You want to have two equally long strands of each colour coming out of the stitch. Braid them to the length you like. I went all the way to the end, so I could wrap the cord around the case twice and still have some left to tie it together. Mission accomplished. Have a great time with your Laptop Case! I hope you enjoyed this pattern, and please let me know if you have any comments or suggestions. Thank you so much! I’m glad you like the pattern. 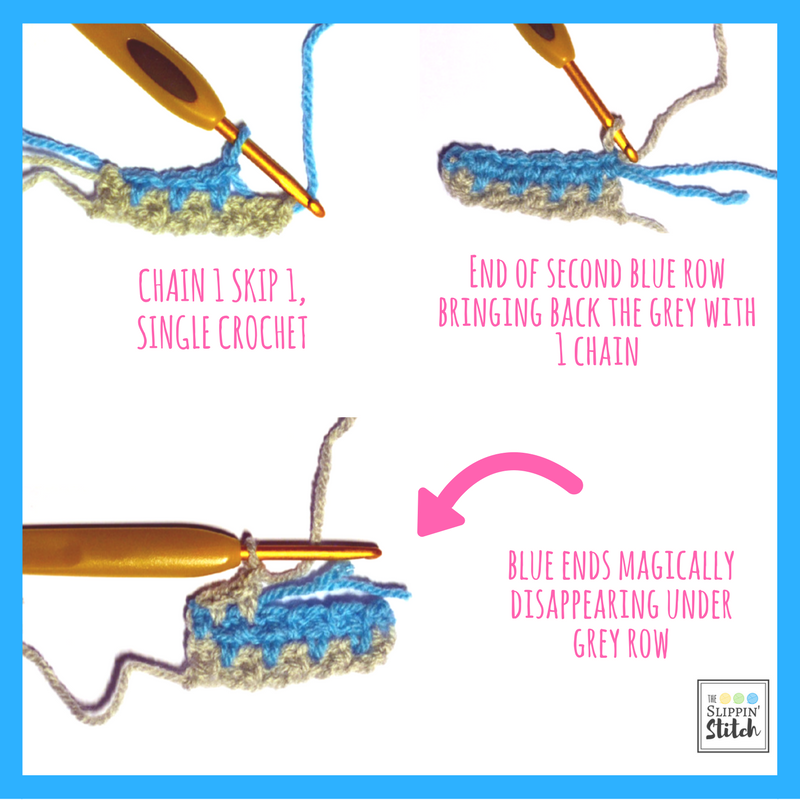 If you’re not changing colour, you don’t need to slip stitch. 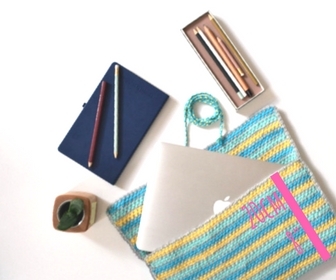 Just end your row on a single crochet, turn and begin the next row. Happy crocheting and let me know how it turned out!